Department of Pediatrics, University of Texas Medical Branch, TX 77555, USA. Copyright: © 2017 Glaser AM, et al. This is an open-access article distributed under the terms of the Creative Commons Attribution License, which permits unrestricted use, distribution, and reproduction in any medium, provided the original author and source are credited. Rett Syndrome (RS) is a neurodevelopmental disorder characterized by partial or complete loss of fine motor and communication skills, stereotypic movements, significant cognitive impairment, and growth failure. A common feature of RS is irregular breathing, predominantly noted during wakefulness, consisting of hyperventilation or breath holding. Pathologic aerophagia is particularly common in RS patients; it often causes considerable distress and has led to death due to bowel perforation. Currently, there is a low level of evidence regarding the treatment of pathologic aerophagia however various pharmacological treatments have been suggested including the use of Selective Serotonin Inhibitors (SSRIs) as described in our report. An 8-year-old female, with clinical characteristics of RS and noted to have a pathogenic variant in the MECP2 gene, presented to our hospital’s ED with significant abdominal distension. In the ED, she was noted to have feeding intolerance and an abdominal x-ray noted significant intestinal dilation prompting admission. At that time, physical exam noted significant abdominal distention and hyperactive bowel sounds. Patient was placed NPO, on maintenance intravenous fluids, and a nasogastric tube was placed for decompression. She was initially thought to be constipated, uncontrolled on home regimen, and medical management was optimized while in the hospital. However, further review of her abdominal radiographs revealed minimal stool burden. Prior to this admission, her workup included normal Celiac TTG antigen titers as well as rectal mucosal biopsies showing normal ganglion cells thus ruling out Hirschsprung’s disease. Throughout admission, her abdominal distension was noted to fluctuate, noted to be less prominent in the morning. All abdominal x-rays noted diffuse intestinal dilatation (Figure 1). She was concluded to have pseudo-obstruction, a severe impairment of intestinal peristalsis resulting in signs and symptoms of intestinal obstruction without any lesion in the lumen. Abnormal breathing patterns, predominated by hyperventilation and occasional breath holding spells, as well as anxious behavior was noted initially. However, aerophagia was not noted by the ED, the primary care team, or during the previous extended hospitalization at another hospital. The patient’s aerophagia, believed to be worsened by anxiety, was recognized by the pediatric gastroenterology consult service only after several examinations. She was subsequently evaluated by the pediatric neurology consult service who recommended starting escitalopram daily. Figure 1: Abdominal radiograph, obtained supine on August 29, 2015. Marked gaseous distension of the colon and small bowel without focal findings. After discharge, patient continued escitalopram daily. Her anxiety improved, aerophagia diminished, and abdominal distension reduced to a tolerable state. RS affects approximately 1:10,000 females worldwide without predisposition to a particular race . Onset occurs during the first 6-30 months of life following a period of normal development . RS is initially diagnosed clinically and definitively with detection of a mutation in the MECP2 gene; nevertheless there are cases where no mutated gene can be found. RS patients commonly exhibit irregular breathing, consisting of hyperventilation and/or breathe holding. The patient may have prolonged periods of breath holding exceeding 1 min and may be accompanied by air swallowing leading to significant abdominal distension, also known as aerophagia . Pathologic aerophagia, as defined by the Rome criteria, is air swallowing causing abdominal distension and/or repetitive flatulence/belching present for greater than 12 weeks in a year . It is particularly common in RS patients, often causing considerable distress and may lead to death due to bowel perforation . Efforts to prevent or alter patient’s periodic breathing have been met with limited success. Psychiatric conditions comprise one fourth of pathologic aerophagia cases; predominant cases include mental retardation, autism, and RS . Currently, there is a low level of evidence regarding the treatment of pathologic aerophagia however various pharmacological treatments have been suggested, including the use of Selective Serotonin Inhibitors (SSRIs) . RS patients often suffer from anxiety, where symptoms may be atypical and thus difficult to detect and manage; in some cases anxiety may exacerbate pathologic aerophagia . It has been shown that the serotonergic system is important for breathing regulation . RS patients and male mice that are null for MECP2 display reduced levels of brain 5-HT, which is important for central chemosensitivity . Moreover, mice deficient in MECP2 have also displayed reduced carbon dioxide (CO2) chemosensitivity, which may contribute to breathing abnormalities . A study of serotonin function in male mice deficient in MECP2 noted that the use of an SSRI resulted in improved CO2 chemosensitivity suggesting that an elevation of serotonin levels has a beneficial effect in breathing irregularities . As seen in our patient, pathologic aerophagia typically presents to a physician with severe persistent abdominal distension . Usually abdominal distension is improved when the patient awakes in the morning and most prominent during the late evening; this is due to minimized air swallowing and flatus elimination during sleep . Associated abdominal pain has been noted as well as functional intestinal disorders, primarily constipation; belching is also common. Audible air swallowing sounds are particularly indicative of the condition. Abdominal radiograph notes gastric and diffuse intestinal distension without signs of intestinal obstruction. Complications include volvulus, intestinal necrosis/perforation and even death . Differential diagnoses of pathologic aerophagia include functional gastrointestinal issues, including constipation and Hirschsprung’s disease, malabsorption syndromes, and anatomical intestinal obstruction . Pathologic aerophagia is a rare diagnosis, depending on pediatricians’ clinical awareness. 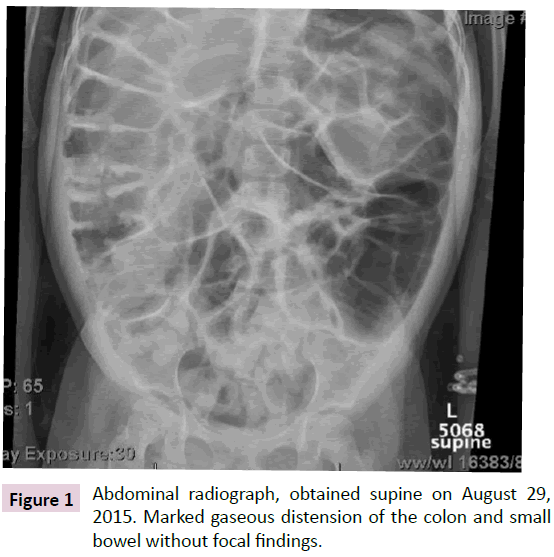 In our patient, diagnosis was based on persistence of symptoms despite constipation management, the exclusion of intestinal neuronal abnormalities, the presence of diffuse intestinal dilatation without radiologic signs of intestinal obstruction, and noted air swallowing accompanied by anxious behavior. There is a low level of evidence regarding the treatment of pathologic aerophagia. Various pharmacological treatments have been suggested but met with limited success. In our patient it was significant to note her anxious behavior possibly exacerbating air swallowing and thus abdominal distension. As noted by Chapleau et al., the most successful management of anxiety is the use of selective serotonin reuptake inhibitors . Studies note lower serotonin levels in the hippocampus of MECP2 null mice compared to wild-type mice thus it is possible that adjusting serotonin levels might improve mood as well as carbon dioxide chemosensitivity in RS patients [2,7]. In conclusion, our case draws awareness to pathologic aerophagia in RS patients, which may be exacerbated by anxious behavior. It is essential for clinicians to diagnose the condition as it may persist and cause severe complications. This case illustrates the success of an SSRI in managing anxious behavior as well as irregular breathing and thus reducing pathologic aerophagia in an RS patient. Although it may be difficult to accomplish due to low prevalence, larger animal and human trials with statistical significance are required to validate the effectiveness of SSRIs in improving pathologic aerophagia in RS patients. Chapleau C, Lane J, Pozzo-Miller L, Percy A (2013) Evaluation of current pharmacological treatment options in the management of rett syndrome: from the present to future therapeutic alternatives. Curr Clin Pharmacol 8: 358-369. Percy A (2014) Rett syndrome: coming to terms with treatment. Adv Neurosci pp: 1-20. Baikie G, Ravikumara M, Downs J, Naseem N, Wong K, et al. (2014) Gastrointestinal dysmotility in rett syndrome. J Pediatr Gastroenterol Nutr 58: 244-251. Jesus LE, Cestari AB, Filho OC, Fernandes MA, Firm L (2015) Pathologic aerophagia: A rare cause of chronic abdominal distension. Rev Paul Pediatr (English Edition) 33: 371-375. Morton RE, Pinnington L, Ellis RE (2000) Air swallowing in Rett syndrome. Dev Med Child Neurol 42: 271-275. Vogelgesang S, Niebert S, Renner U, Mobius W, Hulsmann S, et al. (2017) Analysis of the serotonergic system in a mouse model of rett syndrome reveals unusual upregulation of serotonin receptor 5b. Front Mol Neurosci 10: 61. Toward MA, Abdala AP, Knopp SJ, Paton JFR, Bissonnette JM (2012) Increasing brain serotonin corrects CO2 chemosensitivity in methyl-CpG-binding protein 2 (Mecp2)-deficient mice. Exp Physiol 98: 842-849.